Leading author A.B. 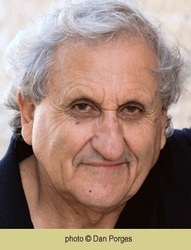 Yehoshua was born in Jerusalem in 1936, the fifth generation of a Sephardi Jerusalem family. After studying Hebrew literature and philosophy at the Hebrew University of Jerusalem, he started a teaching career. From 1963 to 1967, he lived and taught in Paris, and since 1972, he taught Hebrew and comparative literature at Haifa University. He is now Professor Emeritus. Yehoshua has published novels, short stories, plays and essays and is one of the best internationally known Israeli authors. He has received many literary prizes both in Israel and abroad, among which: the Brenner Prize (1983), the Alterman Prize (1986), the Bialik Prize (1989), England's "Best Novel of the Year" for Mr Mani (1992), the Israel Prize for Literature (1995), the Koret Jewish Book Award (USA, 2000), the National Jewish Book Award, the Giovanni Boccaccio Prize (Italy, 2005), the Viareggio Prize for Lifetime Achievement (Italy, 2005), the Prix Medicis Etranger (France, 2012) for Spanish Charity (The Retrospective), the Culture Minister's Zionism Prize for Can Two Walk Together (2013), the Hemingway Prize (Italy, 2014), the EMET prize (2016), the Dan David Prize (2017) and the Antonio Feltrinelli Prize (Italy, 2017). In 2007, his novel Five Seasons (Molcho) was selected as one of the ten most important books since the creation of the State of Israel. Yehoshua's work has been published abroad in 28 languages.